UAH Satellite Global Lower Temperature shows 2018 as 6th warmest. UAH is out for September. This was the coolest September in the last 10 years in the global average. UAH is a satellite temperature dataset, developed at the University of Alabama in Huntsville. 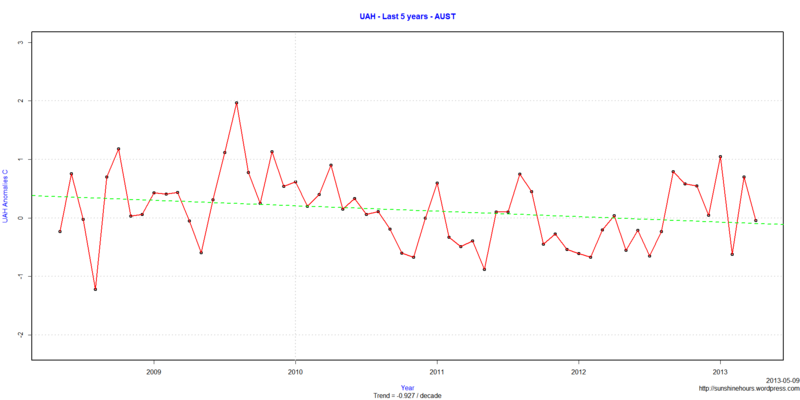 Last month UAH added AUST to its satellite data temperature set. AUST is Australia. According to UAH, Australia is cooling at -.927C per decade over the last 5 years and cooling at -.291C per decade over the last 10 years. UPDATE: HADCRUT4 for March 2013 is out. My post is here. Anyone know where the UAH and HADCRUT data is? While some of the UAH data arrived a few days ago, the downloadable file is still missing April’s data. March’s data arrived April 2. HADCRUT is usually available by the 28th of the following month. February’s data came out March 28. It is now 10 days late. Are they having a conference? March and April too cold to explain? RSS is out. HADCET is out. NCDC is due soon, but not overdue.